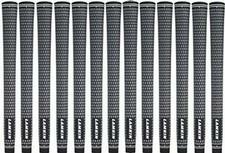 Lamkin Crossline -Black/White Standard Grips (Set of 13) - $59.95 - GolfersEdgeOnline.com - Best Golf Equipment On The Web! A best-seller and Tour favorite for more than 15 years. Crossline delivers unequaled durability, exceptional surface traction and maximum torsion control. If you have any more questions about the Lamkin Crossline -Black/White Standard Grips (Set of 13); do not see the model you are looking for; need custom options; or prefer to not purchase online, then please call us at (630) 656-1291.